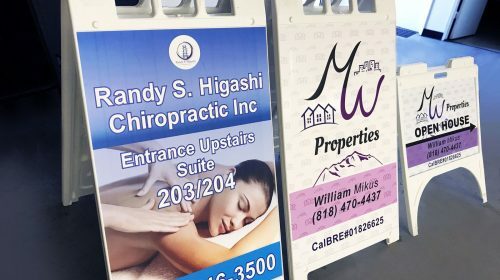 Being one of the oldest and simplest ways of advertising, A-frame sandwich signs are an effective way to attract customers. Passers-by who have no idea who you are, and what you can possibly offer to them, will notice these eye-catching sidewalk signs as these are within their direct sight. We offer you a grand variety of A-frame displays with diverse styles and designs. 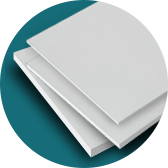 There are 2 types of A-frame displays at our disposal – Standard and Premium. 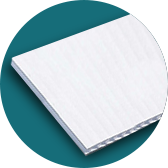 Standard A-frames are the ones on which the information is attached with adhesive Vinyl. 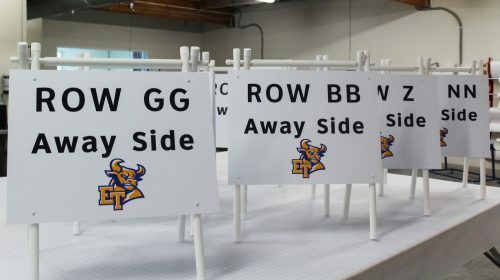 On Premium A-frames the information is displayed with a printed PVC or Coroplast board, which is attached to the A-frame. Thus you are free to order a sidewalk board with your desired design. 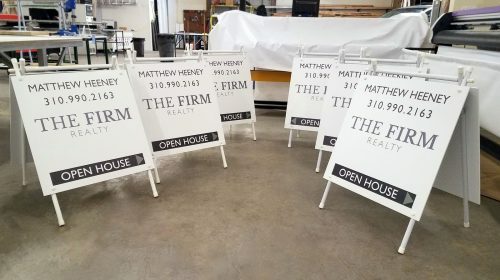 A-frame Signs are perfect for advertising purposes, whether it is a promotional campaign or a sales announcement, be sure that your advertisement will not remain unnoticed. 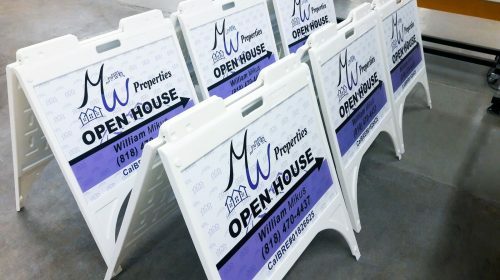 A-frame Signs are often used as Real Estate yard Signs with messages saying “For Sale” or “Open House”. Also, A-frame Signs are used for political campaigns. These Signs can be displayed on the sidewalk, on the lawn, in the lobby and anywhere else you might need. 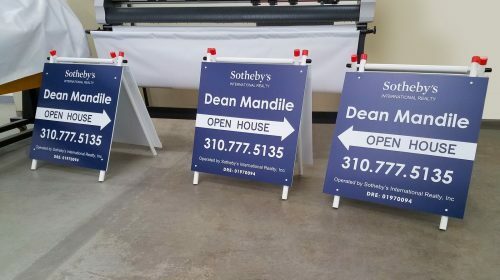 Sandwich boards are very easy to transfer, you just need to fold it and open it back in another location. 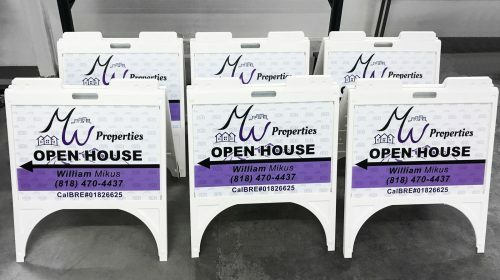 Front Signs provides Standard A-frame Sign displays with unique design printed on quality Vinyl. 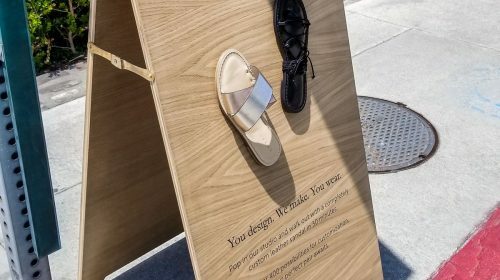 Sidewalk board gives more creative space for creating the graphics and merging with the location. 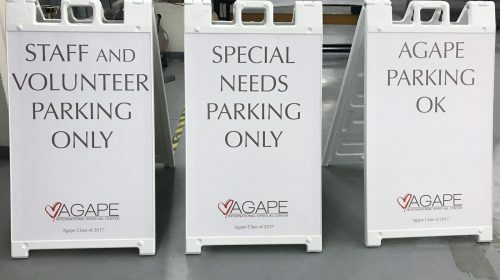 With Premium A-frame Signs you can have your message printed on a PVC board, installed onto the A-frame. As the name indicates standing Chalkboard Signs are easy to write on and erase. They are lightweight and have wooden frame. A-board displays and Chalkboard Signs provide a wide range of possibilities for your business and home. Good to point out the right directions of any special events. 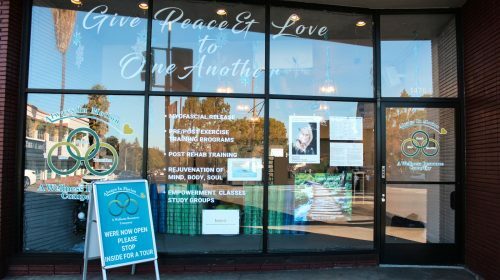 Sidewalk Signs can draw the attention of potential clients to attend restaurants, pubs, etc. You can display daily menus with new food and drink offer or attract with product discounts and special promotions. For indoor purposes, A-frame advertising boards can be used in the information centers, museums, libraries, clinics, etc. No specific installation is needed. For storage, A-board Signs fold flat and do not take too much space. For Graphics installation we use high quality adhesive Vinyl, directly applied to the A-frame signage. 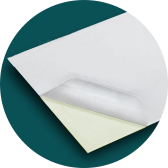 The fade-resistant UV inks provide vivid print of your message and company name. The Vinyl graphics can be changed over time. This allows to keep the A-frame message board, but use it for different events and occasions. The PVC or Coroplast board with your custom design and graphics is inserted onto the A-frame signage. Can be easily changed and reused. Yard Signs – though similar at shape, Yard signage has different construction. 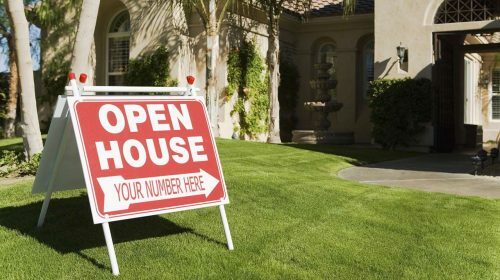 Yard Signs are most of the time used to promote a sale, open house, opening soon and alike messages. X-Banner stands and Roll up banners come as a nice alternative to the A-frame Signs. X-Banners are ideal to place at the corners. Roll Up Retractable Banner takes little space and provides high visibility. Tip1: Posts can be straightforward, to the point with a good humor or sarcasm to give a confident impression and receive curious glances. Tip2: Leave some blank space around the text, add a border around the message for better and faster readability. Tip3: You can use chalkboard display to let your clients and potential customs know about the special deals or that you have discounts or lower priced products for them. Plastic A-frame signs or sidewalk signs are made of plastic and are double-sided. They are lightweight and give neat and professional look. Chalkboard signs, on the other hand, have wooden frame. Wooden chalkboards have retro style and are mainly used in pubs, bars or fancy restaurants. The main difference is that you can change the graphics of sandwich board sign. In case of Chalkboard signage you erase and create another promotion with chalk. A-frame board can have the chalkboard effect printed on vinyl whereas chalkboard signs, if necessary, can be decorated daily, offering for example today’s menu or depict a humorous massage. A-board sign has other areas of applications for many industries and establishments. 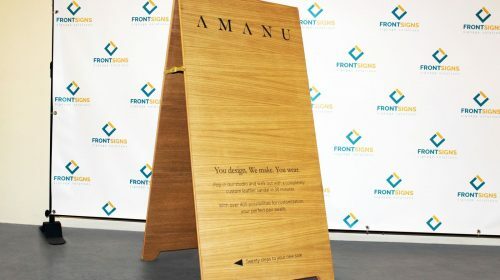 Insurance agents, banks and financial institutions, hotels or motels can use A-frame display to inform about the monthly events and put general information about their brand. 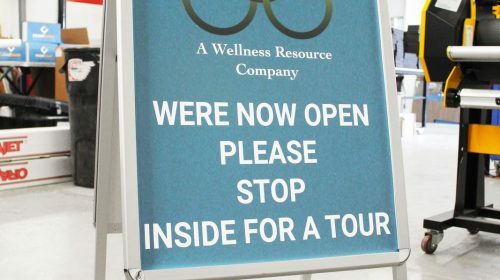 Moreover, Ice cream shops, Gym or fitness centers can use Sandwich boards with a daily basis or even put some humorous quote and design to attract customers. Sometimes, A-frame is also used as yard signage. They fold flat, and don’t take too much space. To use these signs repeatedly, we recommend to store them in a dry location. Just fold it up and store in an upright position, where legs will still support the base construction. It’s just easy to store them lying down, just be careful not to place anything on the Plasticade Graphic area. Thus, you will not damage the sign and you will have no problem to use it again and again.